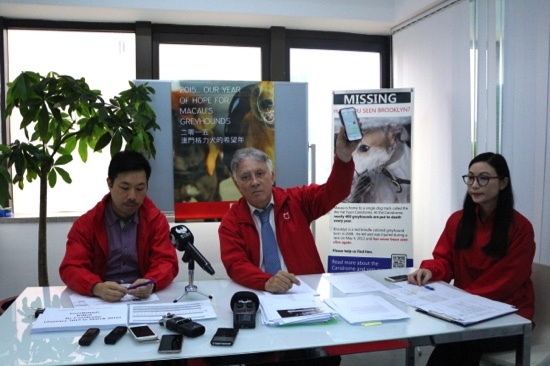 The Society for the Protection of Animals (Anima) criticized the Macau (Yat Yuen) Canidrome, for failing to respond to Anima’s call for a televised public debate over the closure of the greyhound-racing stadium. Albano Martins, president of Anima reiterated that only three dogs have been adopted since the Canidrome introduced the adoption scheme back in 2012 following an order from the government. During Anima’s press conference yesterday, Martins publicizes the content of his letter to Lei Chi Man, executive director of Macau (Yat Yuen) Canidrome Company Ltd., which included his request for the discussion of the Canidrome’s “historical values and importance” to the city’s economy, community and animal welfare. “The letter we sent to them was tough and straight to the point. If you have your reasons, please discuss [them] with us. You know better than us but we’re not afraid to discuss with you,” said Martins. “This should be a good opportunity for them to inform us, to discuss freely with us their arguments. […] They think this is useless,” said the president. Meanwhile according to Anima’s president, 260 to 280 underperforming dogs were killed last year at the Canidrome, but claims that only five or six were euthanized this year between February to April. “When the animal begins to lose races, they’re going down to the lower levels, and after that they are killed. Then, [the Canidrome] will buy another one. […] Buy then kill, buy then kill,” explains Martins. He recalled that the Canidrome used to buy the greyhounds from Australia, which would then be sold in public auctions to gamblers mainly from China, until Australia blocked such exports. “In the beginning, we only asked for adoption. We didn’t want to close the track. But they only produced four dogs for adoption. Who adopted them? Some vets,” stressed Anima’s president. He added that it is time for the government to give the Canidrome land to the surrounding community, as the area is the most populated zone in the region. Martins stressed that the Canidrome only makes little money, stating that the income they earn over a year is only equivalent to five hours of casino earnings. He added that the government had already lost around MOP300 million over the past few years on the Canidrome after reducing the income tax of the company to 25 percent. Anima claims that their strategy to reduce the number of dogs being euthanized is to block the importation of greyhounds as the local government fails to have an animal protection law. Conversely, Anima claimed that its organization supported the regional animal welfare march on Sunday, which was organized by another animal rights group, the Abandoned Animals Protection Association of Macau (AAPAM). The world is watching. Close the Canidrome and put an end to this needless cruelty! Wishing Anima the very best in getting the Canidrome closed. You have a lot of support in the UK! Shame, because they refuse? Because they know they do not have arguments, they know that dogs have no hope, they know that the living conditions are squalid. Who has a clear conscience is not afraid to answer questions. Shame! I am asking you to show a heart for the greyhounds. They are sensifive animals, make great pets and they have not deserved to die this way. We are living in modern times – beeing cruel to animals should be avoided in every country of the world. Please save the Greyhounds!! I adopted two beautiful greyhounds who were “wastage” of the Irish racing industry. It breaks my heart knowing how many of these gentle, peaceful beings are suffering and dying at the hands of greedy, heartless people who see greyhounds as tools for easy money and couldn’t care less about their pain and death. Don’t we, too, want to act in a noble way? The noble thing to do would be to end this trade and close down this industry. And that Ireland sell greyhound and whippets to Macau is a shame for Ireland. Stop Exportation of Greyhounds from Ireland to China (SEGIC) is campaigning to stop Irish greyhounds being sent to the Canidrome by callous Irish owners, who have taken advantage of no Australian greyhounds being sent to the Canidrome as a result of Qantas and Cathay Pacific’s commendable decision not to fly greyhounds to Asia any more. We are holding protests outside the Embassy of Ireland in London and Dublin today against the exportation of Irish greyhounds to Macau. On Saturday 7th May, there will be protests all over Europe (in Ireland, the UK, Italy, Germany…) against both the exportation of Irish greyhounds to China and the Canidrome itself. And on June 2nd, there is a protest outside the Department of Agriculture in Dublin, where a petition to close the Canidrome that already has over 250,000 signatures on it will be handed in. Greyhound advocates all over the world are focusing their attention on the Canidrome and the dogs being sent there. Kudos to ANIMA for all the hard work they’ve done and are doing for the greyhounds. You have our full and committed long term support. In every country we are watching at you! Stop this cruelty. Stop the useless killimg. Close the canidrome and become an example to be replicate, not to be blamed. Thanks. Well done Anima for all your hard work trying to protect these greyhounds, SHAME on Macau, SHAME on the Canidrome, SHAME on the Chinese and Irish governments and callous Irish greyhound owners that allow this to happen. Greyhounds are beautiful, quiet, intelligent, loving pets – THEY ARE NOT COMMODITIES TO BE USED AND ABUSED BY THE CANIDROME and then killed. The news about this is spreading fast and the world is watching. We will not let you kill and abuse our greyhounds, they are loved and we want them back – Shut down the Canidrome. Thank you Anima, you have many supporters around the world. Anima is a voice for Greyhounds. God bless them all ! I protest against Greyhounds exportations from Ireland to Macau where these gentle and sensitive gods will suffer their plight until their painfull death. please respect those lovely animals!!! Close the canidrome! Also Germany is watching at you! Shame to China and the Irish owners who sell her poor greyhounds to this HELL! It’s time to end this. The rest of the world is becoming aware of this barbaric treatment and watching you. How can you sleep at night knowing the atrocities you are committing everyday. Let the people gamble with slot machines and other avenues, not at the expense of animals. Shut down the canidrome , rehome the poor greyhounds to loving homes outside of this cruel country.Put an end to your country’s general barbaric treatment of dogs , of man’s best friend. Close this hellhole of a race track and go to the casino for your bit of fun. Ban racing in all of China and the rest of Asia. Beginning with the Macau Canidrome( the worst hellhole greyhound race track in the world shame on Ireland for exporting greyhounds to that hellhole for greyhounds. nine Irish greyhounds has recently been exported to that rotten place Three of them are as follows:Crossfield Simon,Crossfield Leona and Two Stone Tadgh let us not forget poor Brooklyn that is kept alive to avoid bad publicity. Let me put it this way by naming these poor greyhounds and sharing pictures of them it might keep them alive but not happy or safe they will be happy the day they are adopted out to loving families who regard them as we do our greyhounds namely as family members. Not food or betting units.Progress can be made in favour of the greyhounds ban racing at this hell hole stop exporting more greyhounds to this rotten spot this blemish on China and her entire lack of animal welfare. Bad Karma will visit those who abuse animals. STOP abusing our dogs. The world is watching. Please stop sending Irish Greyhounds to Macao! The best would be to close the Canidrome. Yes, the world is watching …. it’s time to end this and it’s time to ban Greyhoundracing! Where is your compassion? End this cruel exploitation of Irish Greyhounds, who are condemned to death at the Canidrome. The Canidrome has the worst record in the world for Greyhound deaths you should be ashamed of that reputation. The world is watching you. You should stop this exploitation of greyhounds and get your entertainment elsewhere. Dogs do not deserve to be transported half way around the world for your entertainment, then killed when you have run them into the ground. Shameful! Yes, they certainly do deserve to be re-homed. Unfortunately, there are more dogs than homes for them. Public perception needs to change in order to educate people about what wonderful pets Greyhounds are. Those of us who are adopters need to be involved in public outreach – I’ve been doing so since I adopted my first Grey 13 years ago. I hope this cruelty is going to stop soon. People who support racing in China should be ashamed. Karma will get you all one day!!! Close the canidrome. The world IS watching. Entertaining humans at the expense of the lives of greyhounds is pure abuse. Ireland you need to lead by Australia’s example and stop exports. You’re just as guilty and also have blood on your hands. Bring this shame to an end now. We see you! How can this be in an evolved society that this horrid cruelty is taking place? We will not be dragged to the gutter for such entertainment! The world is watching, take this step to join civilized humanity. End this. Stop dog racing. It’s not fun. Canada is watching and we love dogs so are angry about this. Leave them alone clise the candidrome. The world is watching this horror unfold. We will not be silenced with regards the horrors off dog abuse at Macau, we will not go away. We will continue with the capaign to cease trading of Greyhounds from Ireland to China, with vigour passion and faith that these horrors will stop.